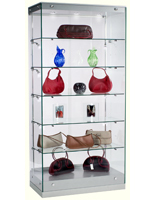 Frameless design offers a clearer view of merchandise for customers! 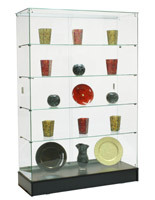 Tempered glass construction is less likely to break than traditional, annealed cabinets! 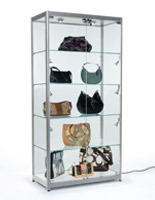 Hidden wheels for easy movement of the frameless tower showcases within a store! Assembly required for reduced shipping costs – see video below for step by step instructions! 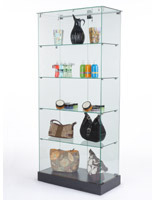 These black frameless tower showcases are part of the EuroVū Simplice line of glass retail cabinets. 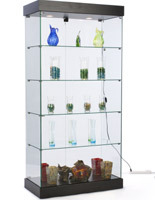 Each unit includes contemporary European styling, along with many great features. 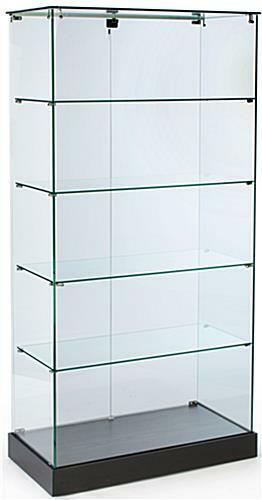 The frameless tower showcases that are 17-3/8" deep, also known as display cases, are perfect for various items, from jewelry or glassware to museum artifacts, souvenirs, trophies, awards, or sports memorabilia and more! 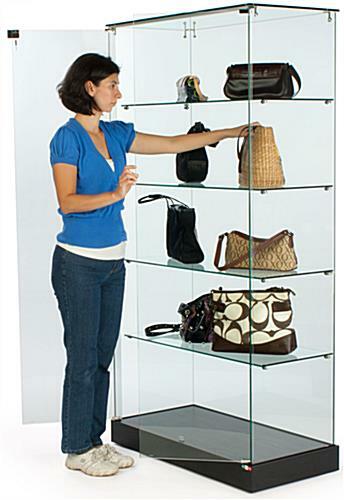 These black store fixtures are a small portion of the extensive selection of Simplice displays. 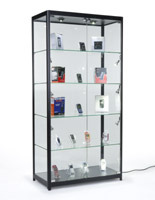 Users can purchase multiple frameless tower showcases with wheels to create a cohesive configuration. The design of these store fixtures rather simplistic, allowing them to blend in with existing store fixtures, as well. Elegant double swinging doors (versus traditional sliding styles), require approximately 17" clearance for opening (cases are easily maneuvered upon wheels if necessary). These units ship unassembled. Requires 1 man hour for assembly (will take 2 persons approximately 1/2 hour). 35.3" x 71.0" x 17.4"
This is the 2nd case like this I purchased, but it looks like the design changed slightly from the 1st one and there are some cosmetic changes that don't allow them to line up quite right. The packaging of the glass continues to amaze me, as neither shipment had any broken panels. However, one of the preinstalled "L-brackets" for the top panel was bent in the box and snapped in 1/2 when we tried to straighten it. So we cannot properly attach the top to prevent the entire case from collapsing. The plastic channel strip that installed on the front door to seal the gap and prevent the glass for hitting the other door was also mangled in shipping and is unusable. Overall, they're still great products and pricing and I would purchase one again.